Happy Easter! It’s time to set the table, gather with family and friends, and celebrate the risen Lord! I’m also excited to be a part of the Vintage Easter Joys blog hop today! Can’t wait to see all the creative inspiration these talented ladies have come up with! 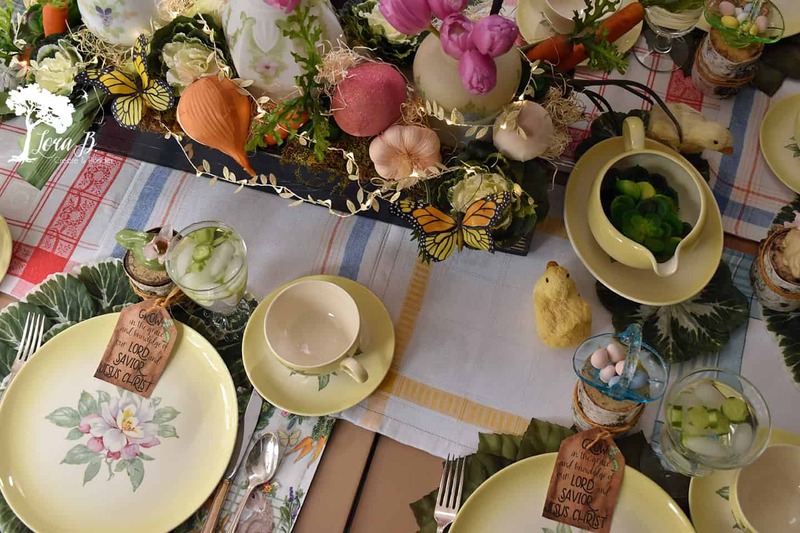 This year my Easter table brings together a love for vintage and the inspiration of a luscious veggie garden. 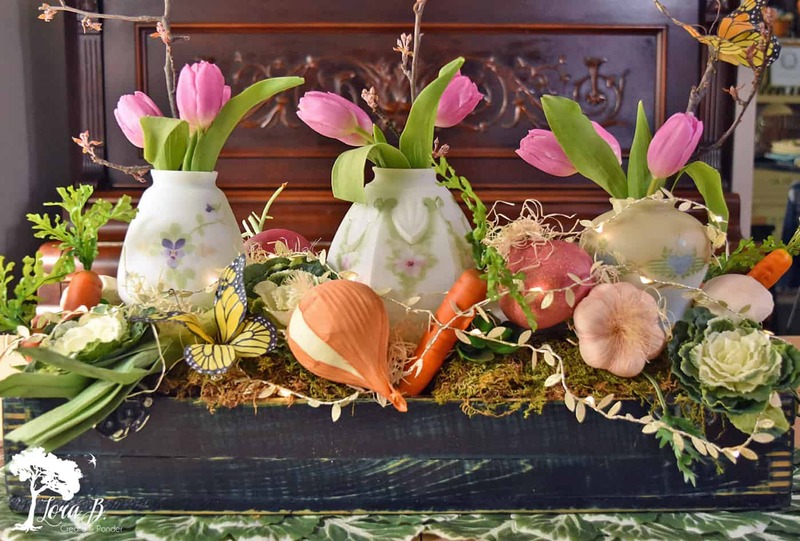 Welcome to An Organic Vintage Easter Table! 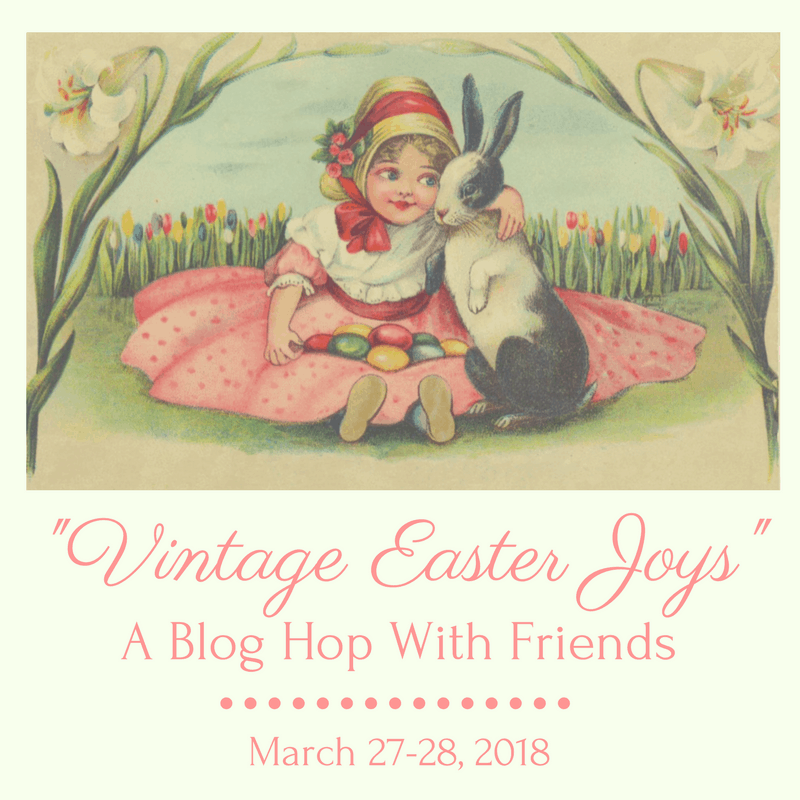 This post is part of a Vintage Easter Joys blog hop, hosted by Amber of Follow the Yellow Brick Home. 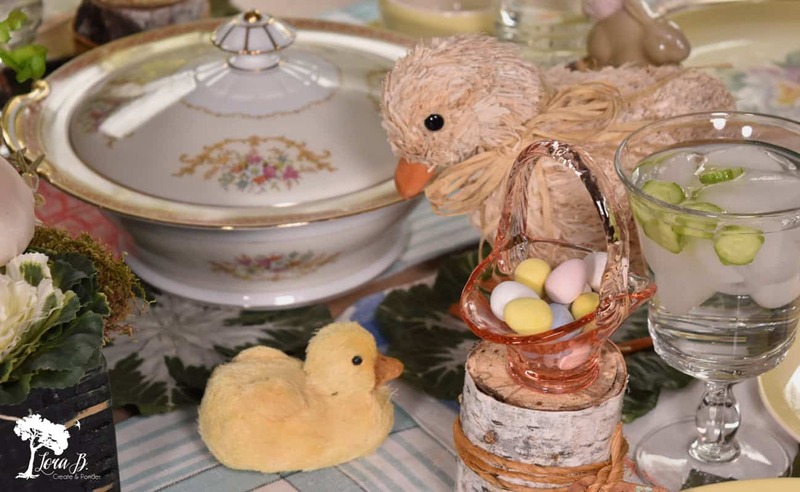 If you’ve come over from Debby Goes Shabby’s “Springfully Vintage Easter“, welcome! Debby has such a beautiful touch with everything she does! I’ll have all the links to much more Vintage Easter inspiration at the end! My Easter table began by deciding which set of dishes this dishaholic should use! A pretty set of soft yellow pottery, featuring my favorite peony won the contest. Several weeks ago, I also made some “Leafy Placemats” to add to (and imitate) some I’d purchased last year. This combo of plates with the place-mats is garden fresh! I love the illustrations that come on paper napkins! These pretties are like a page torn out of a children’s storybook. But I also love vintage cloth napkins. 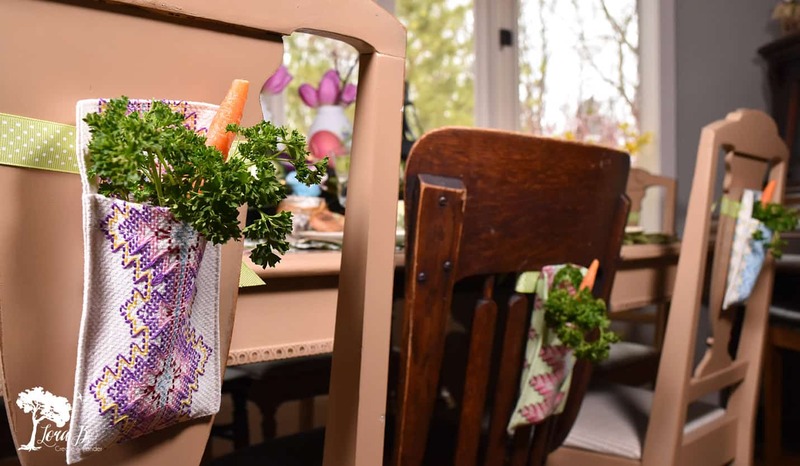 I was able to use both this year with an easy re-purpose project, fashioning my vintage napkin collection into a runner for the table, “Vintage Napkin Runner“. The bright, happy colors of the Vintage Napkin runner was the perfect foundation for the whole table. 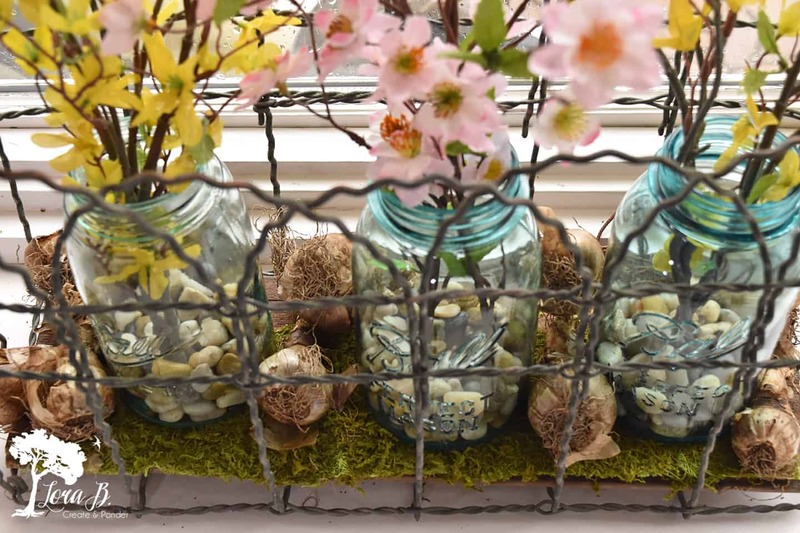 The veggie garden centerpiece was centered around a trio of beautiful, vintage light fixtures. In my head, I was going with the theme that Easter is all about the “Light of the World” coming to save us. I love to incorporate deeper themes in my decorating. Pretty + meaningful = extra special;) You can see how I created this centerpiece with 1/2 of an old toolbox in my post, “How To Build a Centerpiece” (it’s not as hard as it looks). I love how the leafy placemats coordinate with the little cabbages and veggies in the centerpiece. It’s like the whole table just turned into a garden! And the pretty yellow plates are the ray of sunshine needed for everything to grow! Every table needs some special touches to feel like you’re opening a present when you sit down. I love to add a special note and some whimsy to each place setting. 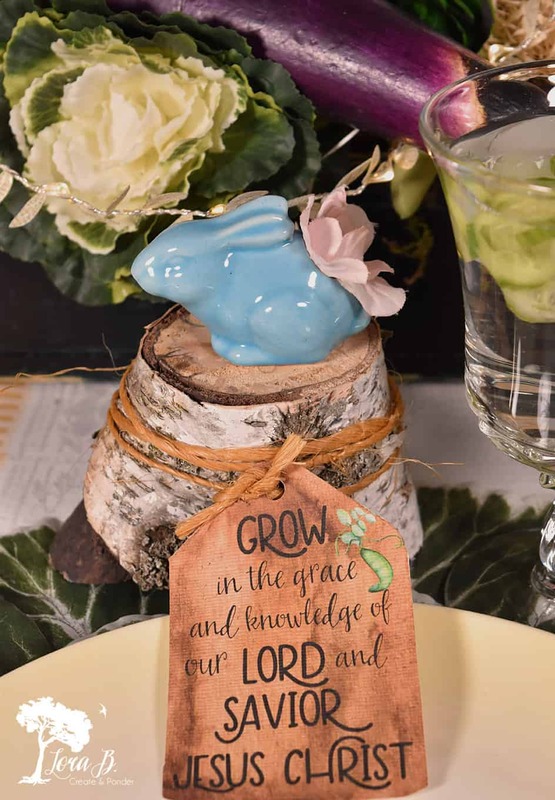 To add to the organic vibe, I placed short sections of birch logs by each place setting and added a verse of inspiration and hope for each of my guests. I tied it on with simple garden twine for added texture. 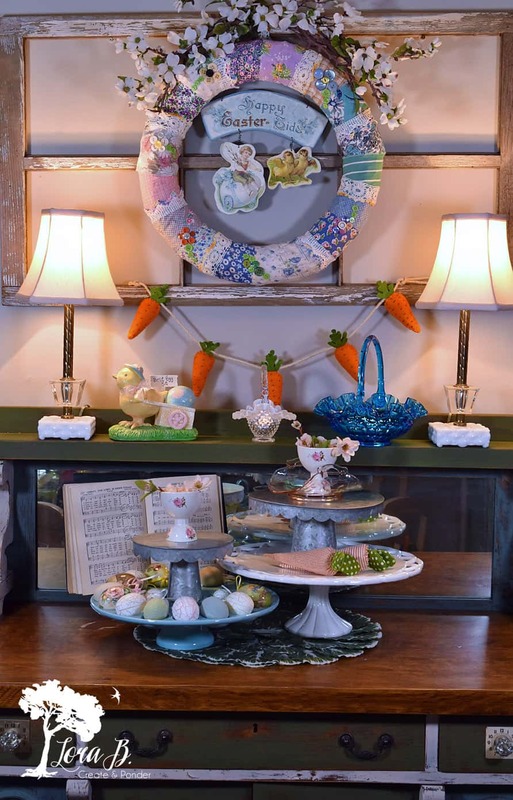 Topping each log is either a vintage bunny or an antique glass Easter basket with treats. If you’d like this little message for your table guests, you can subscribe to my newsletter below and print them off yourself! This sentiment from 2 Peter is my hope for my blessed family members! I also added some cute little ducklings to the center of the table for some whimsy. Spring is when all the baby animals appear and I love to highlight that new life! 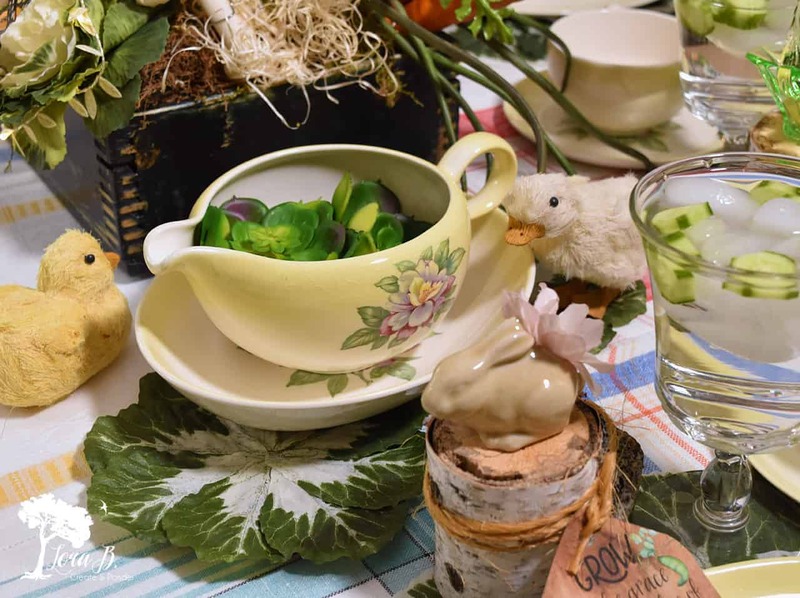 Cucumber water is not only delicious, but fits in with the table’s theme! Last year, I whipped up some fun “Swedish Huck Utensil Pockets” for our flatware. This year I decided they would look cute hanging from each chair with an extra garden touch. I’m excited to be able to use these graphic treasures again! 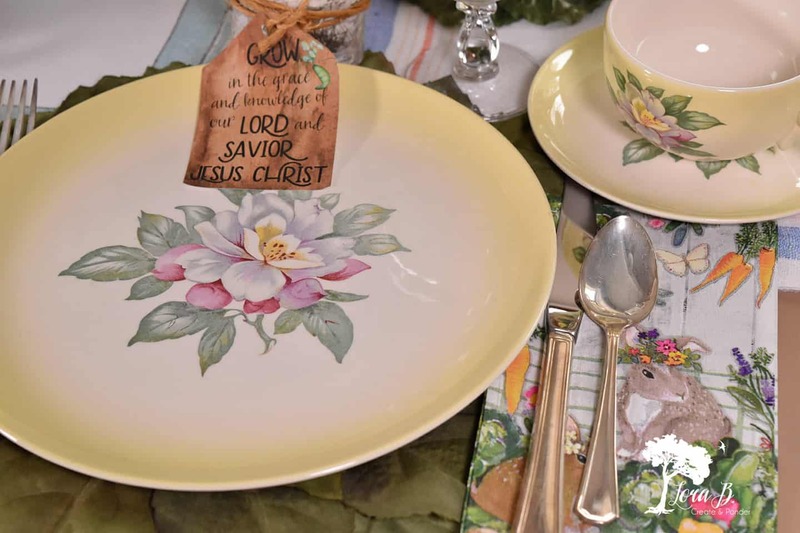 Setting the Easter table also includes adding some springtime decor to the room! Especially when there’s still snow on the ground outside:( Yep, we’re faking spring here in MN when Easter is this early! 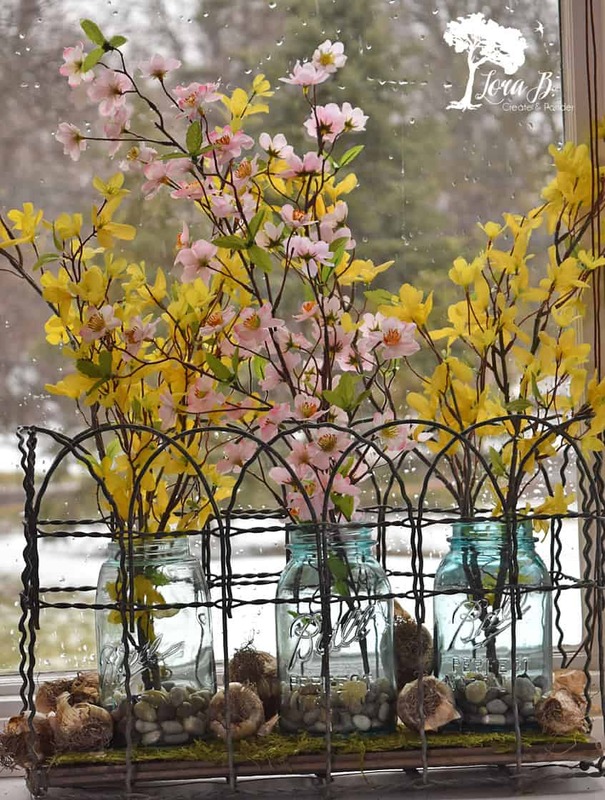 To disguise what’s outside the window, I placed some spring flowering branches in vintage aqua ball jars, nestling old bulbs around the base. I lined them up in our vintage fencing squares Mr. Fix-it makes for me. Disguise success! My buffet is all set with some pedestals for Easter treats when the real day arrives. I incorporated an old hymn book on a stand, open to an Easter favorite. Mr. Bunny is on the top of our piano, watching over the festivities! If you’d like to add the little “Grow” tag to your decor, simply sign up for my newsletter and I will send you the password to my FREE members-only Resource Library! You’ll have access to my ever-expanding library of helpful and seasonal printables! You’ll also keep up with my creative adventures! If you’re already a Lora B Insider, check your weekly email for the password to the Resource Library! 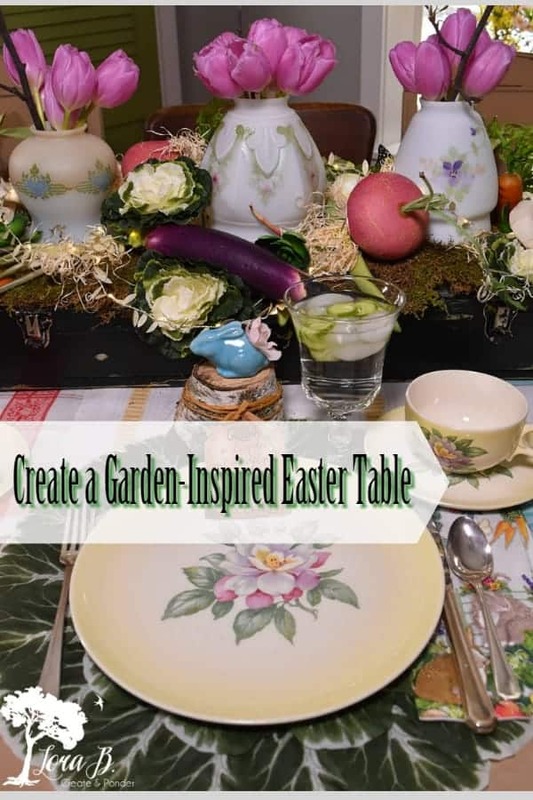 I hope you enjoyed seeing the process behind creating an organic vintage Easter table. Using treasured pieces along with handcrafted items and a little creativity results in a special, memorable time for your holiday gathering! What a beautiful table. The layering you did is just perfect. I am going to have to scroll back up and take a second maybe even a third look! Just adorable! It’s a pleasure to meet you via Rita @ Panoply. Thanks for the sweet compliments, Christine! I loved Rita’s table too! These blog hops are such a great way to find new, inspirational blogs! I enjoyed looking at all of your vintage Easter decor! 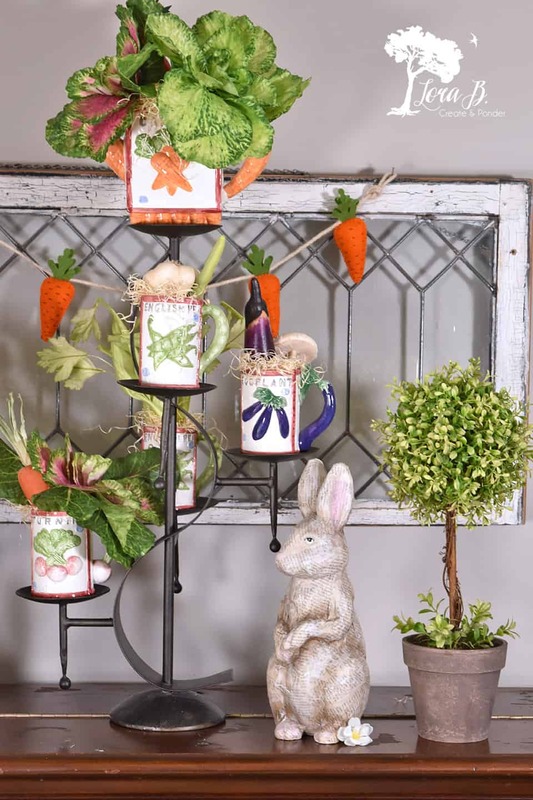 I love your centerpiece and the stand on your piano with the little veggie mugs is so cute! Im so glad to have found your blog through this hop! Glad you enjoyed it, Angelina! And so glad you found my site, too! I’d like to come to your house for Easter! Your dining room is just delightful. I loved the old hymn book: I have to go to Easter sunrise service and church @11 so I get to sing ALL of my old favorites. We have a newish hymbook and I don’t know the numbers yet! You included so many lovely details that I enjoyed so much. Happy Easter! 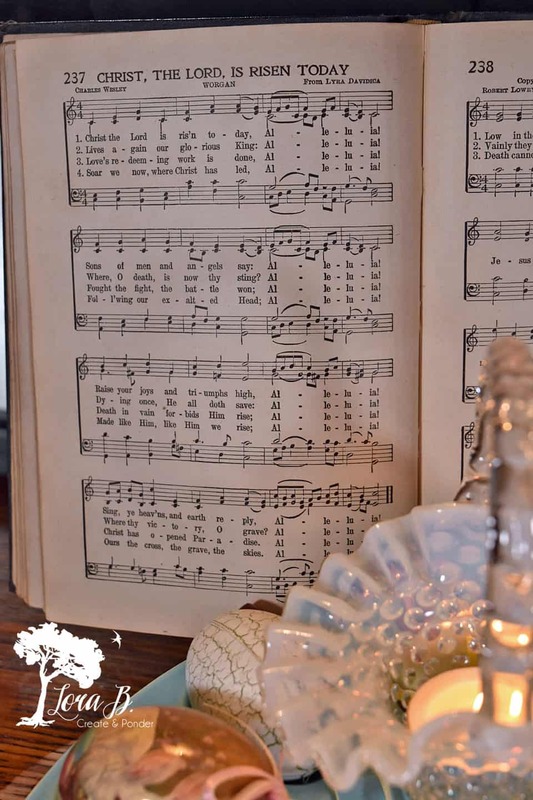 We love all those old hymns & don’t get to sing them at our church:( We just have to get our fill on the radio these days! Have a blessed Easter, Kathy! Lora…what fun! So many beautiful and creative ideas. The lamo shades and reference to Jesus…perfect! And tulips are always a good idea. Love how you blocked out the snow, the old bulbs are a perfect touch. Thaks again for joining the hop. Happy Easter! Glad you enjoyed it all, Amber! And thanks for inviting me! Fun to be with a whole new group of ladies! I just adore your veggie garden centerpiece! It is so beautiful and creative! Your whole tablescape is just gorgeous! Thanks for the inspiration! Happy Easter! Lora, you have so many wonderful and unique elements in your tablescape. The dishes are wonderful and so very vintage. The napkin tablerunner, oh so cute. your wooden box centerpiece with old lampshades is so fresh and fun, but my favorite has to be that wonderful wreath made with fabric scraps. Perfect! Thanks, Debra! You are too kind;) I created that wreath last year so I could enjoy all those beautiful, vintage fabrics everyday! I’m always coming up with fresh ways to enjoy my vintage treasures without looking too antique-y. Breathe new life into the old! Love your table setting, love the light fixtures, very creative! Love your vintage china also, so pretty. So full of light and pretty colors! My favorite are the little wood trunks with name tags. Happy Easter. Lora, you have so many cute ideas presented here! FIrst, you’re preaching to the choir when you speak of dishaholics, lol. Those pale yellow dishes are beautiful! I love the huck towel pockets, and used on the chair backs – great idea. The other outstanding idea are the garden fence squares – love those! Happy Easter to you, and it was a pleasure sharing this week’s tour with you! Thanks so much, Rita! It was a fun hop to be a part of! 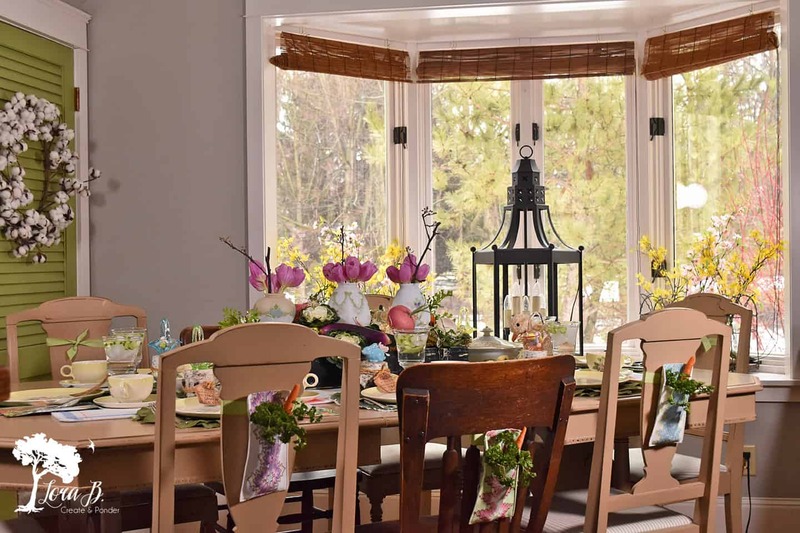 Lora, your Easter decor is gorgeous! 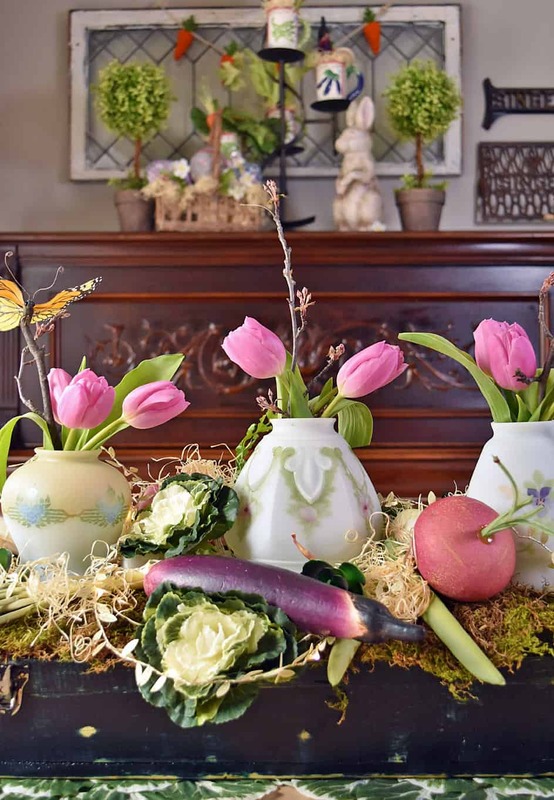 I especially love the vignette on top of your piano – those veggie mugs are just too cute! Thanks, Michelle! My mom gave me that cute set years ago and I so enjoy bringing it out each spring to decorate with! This is all so beautiful, Lora! Who wouldn’t feel special at your table? Love the centerpiece…the dishes are beautiful, too! And that window treatment? I’ll be doing that…gorgeous! Happy Easter, Lora! Lora your yellow dishes are so lovely. I absolutely adore how you presented the Peter 2 bible verse. May all of Easter’s joys be yours. Your table is so fun and full of whimsy! Love the creative use of the light fixtures. Plus, how wonderful to have them relate to a special Easter meaning. Love the display of the hymn too. Your dishes,, placemats, and utensil holders are all darling. Looking forward to getting to know you. Decisions, decisions, right?! 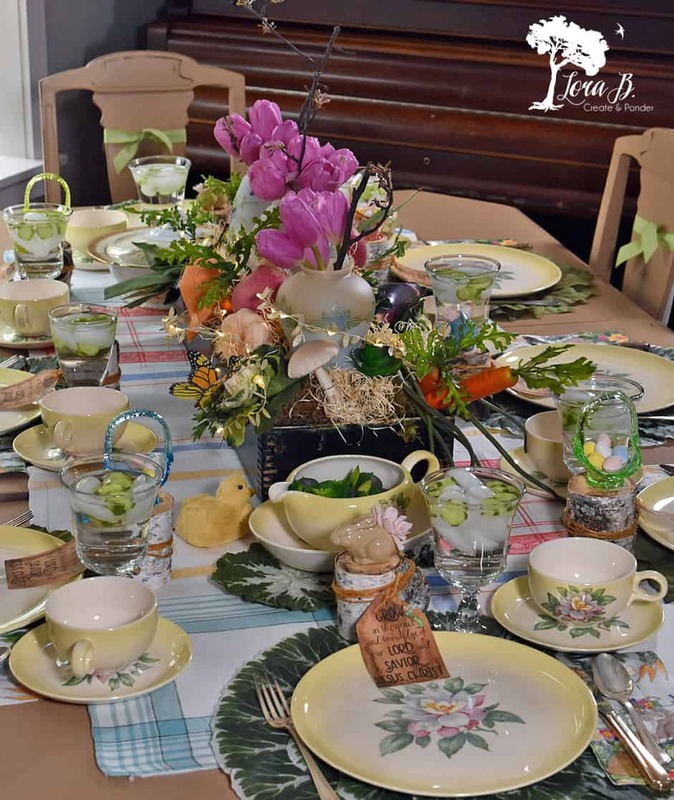 Thank you for sharing your lovely tablescape at Vintage Charm!